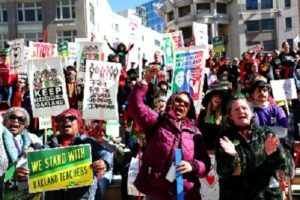 Editor’s note: This article responds to analysis New Politics has already published on the Oakland teachers’ strike. In hosting different viewpoints on the strike, New Politics continues its tradition of opening its pages (and now its website) to debates about labor struggles and social justice. If you agree this is essential for the left, please help sustain New Politics by donating and subscribing now. The Oakland Teachers Strike of 2019 was a victory for teachers and the movement for quality public education nationwide. It had tight organization, terrific multiracial local organizing led by new President Keith Brown, creative grassroots leadership at almost every school site, overwhelming teacher and community support, and inspirational tactics. There is little doubt that the strength of the Oakland strike together with an equally strong Los Angeles strike and a looming Sacramento strike have shaken up the calculations of California power brokers about what is possible in the education battles ahead. However, one little understood fact about Oakland’s situation has left room for mainstream media to blame layoffs and program cuts on the teachers. Oakland has been under partial or total state control for sixteen years, and its state-appointed administrators ran up a $50 million debt at 8% interest with no input from Oakland residents and officials. The district is still paying off that debt and is still being managed in the background by a set of nearly invisible non-elected actors who are empowered to make decisions for what is arguably America’s most multi-racial and progressive city. Because few are aware of this reality there has emerged a post-strike narrative that the teachers’ settlement is responsible for cuts and layoffs which were actually demanded by the State long before the strike occurred. Oakland’s struggle with state control has important implications for every urban district, and every education-related union. The loss of local control gives state controllers the ability to demand layoffs and cuts and even to impose union contracts. In 1988, a year after Oakland elected a majority African-American school board, a set of corporate-oriented Democratic politicians started trying to take over the district. Due to the courageous leadership of then school-board President Sylvester Hodges and a very small coalition of oppositional residents, the district was saved from state control for 15 years by maintaining a balanced budget and ignoring the racism of a state government far whiter than many of the cities it dominates. It is the only instance, I believe, where a district has been able to fight off state control. In 2003 Perata succeeded in getting a take-over bill (SB 39) through the California state legislature based on a debatable deficit. The school board had all its power taken away, and a state administrator, Randy Ward, trained in the superintendent’s academy sponsored by real estate developer, Eli Broad, took over the school district. The financial position of the district got worse every year the state was in charge, going from what was approximately a 39 million dollar debt to an 89 million debt, all of it spent by state administrators. When a local district is said to have an unbalanced budget the punishment is state take over. But, when the state makes the district’s deficit worse, who get punished? Not the state overseers obviously. Local control was supposedly returned to the district in 2009, but in fact, a state trustee and the Bakersfield-based Fiscal Crisis Management Assistance Team (FCMAT) have continued to have authority over district decisions. What was the impact of state control on the strike? The district has claimed that the strike is responsible for possible layoffs of other workers that may occur next year. In fact, the extra $50 million spent by state administrators with no input from Oaklanders would have prevented many layoffs and cuts. And what about the teacher demands? Is an 11% raise enough? Given that the State had the power to impose a contract with no raise, it should be considered a big victory. Is a 5-month moratorium on school closures enough? No, but given that school closures is one of FCMAT’s biggest priorities, it is a victory, especially if teachers and community spend that five months organizing against those closures, and the Oakland Education Association has already declared that it intends to do just that. Few people in Oakland are fully aware of the extent of the state’s control. The community and the union were not able to win on preventing program cuts, because the state had already mandated that they must occur. FCMAT CEO Michael Fine told the school board in October 2018 “You will make these cuts or they will be made for you” referring to $20 million in program and personnel cuts being demanded of the district. And it does not take a conspiracy theorist to note that the displacement of African-Americans from Oakland and the closure of schools with a disproportionate number of African-American students are more than a coincidence. The power to close schools, a major demand of FCMAT, is an important aspect of gentrification. The schools attended by Oakland’s long-term residents are being made to disappear to make room for the more segregated and tracked schools likely to appeal to more affluent gentrifiers. One of the biggest losses of this year has been the district’s closure of a neighborhood middle school, Roots, leaving several hundred youngsters devastated and facing few choices beyond a middle school located 2 ½ miles away. The local Oakland community needs to do some investigation of its own into its non-elected overseers, and the Sacramento unionists will need to strategize against the threat of state takeover which has greeted talk of their strike. It is actually possible to turn these battles against the politicians who initiate anti-democratic takeovers. Don Perata was certain that his take-over of the district would lead to his being elected Mayor. But by the time he ran in 2010, school activists were so angry with the results of state control, they put enormous energy into campaigning against him, and he lost, despite spending three times as much money as his nearest competitor. Other politicians are a bit more leery of being associated with take-overs as a result. For all the complications and impediments, the people of the U.S. have a better chance now of getting to a strengthened and transformed public school system than we have had in the several decades before this surge of grassroots-driven teacher strikes. Kitty Kelly Epstein, PhD is a scholar, a teacher, an activist and the host of a radio show on KPFA 94.1 FM. Her book A Different View of Urban Schools: Civil Rights, Critical Race Theory, and Unexplored Realities elaborates on multiple issues including school district take-overs, diversifying the teaching force, and the Eugenics history of standardized testing. ‹ An Election Challenge: Time for Change at NewsGuild?